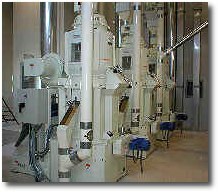 The equipment used in the PeriTec process is able to sequentially strip the bran layers, giving the degree of control that the commercial flour miller demands. Within one machine bran removal rates can be adjusted from a few percent in order to heavy scourer the outside of the grain to 10 - 12 % required for some specialist processes. Another advantage of the PeriTec System is its flexibility. The ability to adjust the amount of bran removed is ideal for mills required to produce a range of products such as wholemeals, browns and white flours. When producing wholemeal flours, the abrasion chamber can be by-passed and only the friction chamber used to heavy scour. When the mill produces white flour, the whole machine is used and higher optimum debranning rates are achieved. The PeriTec Debranning Process also has important applications in starch and ethanol production systems, where the removal of bran prior to milling can substantially improve the efficiency and performance of subsequent processes. During the 20th century the conventional wheat milling system became dominant for the production of bread flour and high extraction white flour. 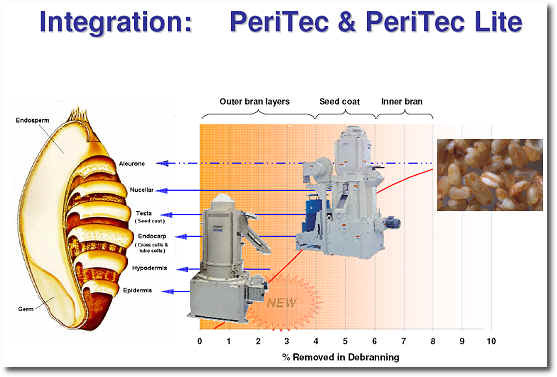 The PeriTec System removes the wheat bran layers, apart from that which is in the crease, before milling. Hence, there is less bran to remove so the milling 'break' system can be shortened and a greater amount of semolina and middlings is produced with a better product colour. Mill flow diagrams are less complex as there is less bran, a potential contaminant of white flour, to be processed in the mill. A conventional milling system loses most of the nutritionally rich aleurone cell layer, as it does not effectively strip it from the inside of flakes of bran. The PeriTec system allows substantially more of the aleurone cells to be released. The removal of the peripheral bran, prior to milling, results in finished products that are brighter in colour and free of bran specks whilst retaining more of the nutritional components of wheat than a conventional milling system. The process is exceptionally effective when used in durum semolina mills as it allows a large amount of coarse, clean, semolina to be released early in the milling system. The semolina mill diagram is less complex than a conventional semolina mill. It can also be utilised in starch and gluten production plants. The reduction in the risk of bran contamination reduces the potential problem of undesirably high fibre content in the flour going to the starch extraction plant. Recent results from several UK mills prove that the PeriTec System improves the Hagberg Falling Number of wheat. This allows the miller to avoid problems in a year of low Hagberg values, or to take advantage of purchasing lower cost low Hagberg wheats and then improving them in the mill using the PeriTec Process. The process of milling Semolina from Durum Wheat is very different from the milling of all other types of wheat. When the Satake PeriTec Debranning Process is applied to Durum Milling, the resultant pasta has a much improved brighter colour, the mill diagram is simpler and a higher percentage of top grade semolina is produced. The increasing consumption of pasta foods demands a high level of technology in the milling process to supply top quality semolina for this expanding market. Satake have developed a milling system to meet this demand, and, as a result of Satake research into Semolina milling, better results are now being obtained. 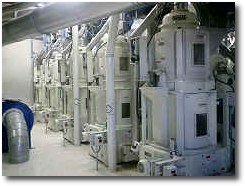 Many of the PeriTec Systems that Satake have supplied for Durum Milling are installed in front of mills that were already existing. All mills have experienced increased capacity, greatly increased coarse semolina production and a significant reduction in lower grade flour production. Extract of an interview with Francesco Casillo of Molino Casillo, one of the world's biggest durum millers from May 2005 issue of World Grain Magazine..
PeriTec Lite is a new process from Satake. It designed for lower rates of bran removal than full PeriTec. It is the ideal system for the ‘cleaning-up’ of the outside of the wheat kernel. This removes the bacteria, toxins and other residues contained in the outer bran layers, presenting a cleaner wheat to the grinding section of the mill. As shown on the graph PeriTec Lite will remove 1 – 3% bran, while PeriTec removes typically 5 – 9%.